This website is for football fans going to away games. The links below take you to Google maps for every ground in the Premier League, Championship, League One and League Two. 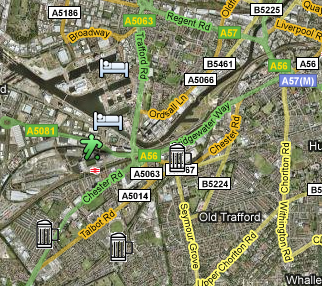 Each interactive map shows you the location of the ground and of nearby away fan friendly pubs. They also show the location of the railway station, the coach station and one or two budget hotels, including the facility to make direct online rail, coach and hotel bookings. In fact, everything you need to plan travel to and from the game, where to drink and, if stopping overnight, where to stay. 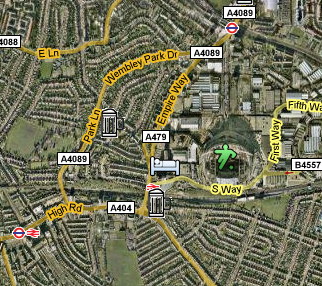 Click the map to jump to our Manchester United map or select your destination from the list to the left.